Exploring all topics to do with the wonderful postage and revenue stamps issued by Canada since 1851, and the history of their use. Comments are welcome on all posts. 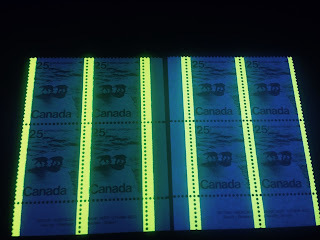 Our mission is to spread all relevant knowledge connected with Canadian stamps and postal history. With over 40 years of philatelic experience, we are your trusted Canadian stamp dealer! 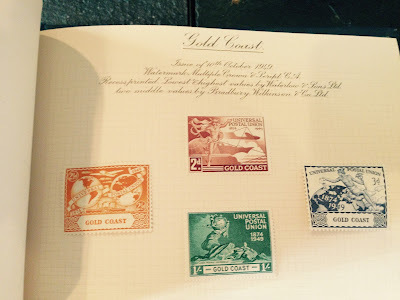 Starting in the late 1960's many African countries began printing their high value stamps from gold foil which had the design embossed in whole or part. Some of these were produced from 100% foil, while others, like the above stamp from Upper Volta, which is now known as Burkina Faso, were printed on paper which had a coating of gold. These were largely eschewed by traditional collectors at the time they first appeared, with the result that many are quite scarce today. Granite paper is a wove paper in which coloured threads, usually made of silk, and usually black in colour appear on the surface of the paper embedded within it. The above scan shows two Japanese stamps from the 1920's that were part of the same issue. 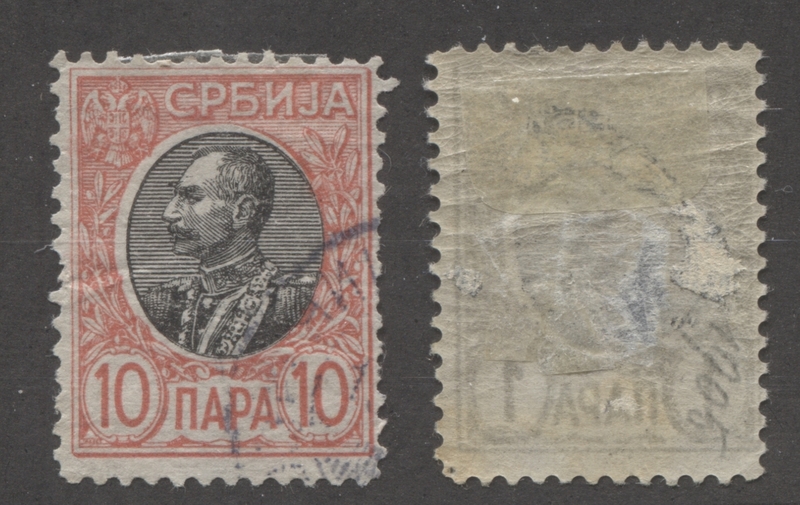 The stamp on the right is printed on regular wove paper, and shows no fibres on the paper surface. The stamp on the left shows several black fibres visible on the surface. This is what philatelists refer to as "granite paper". Again, this is not a very common paper in British Commonwealth philately, but it is extremely prevalent on the stamps of Western Europe, especially those of Luxenbourg, Liechtenstein and Switzerland. The last time this stamp changed hands, its owner traded a block of four inverted Jennies worth an estimated $3 million for this stamp. The most common version of this stamp can be had for less than $20. So being familiar with grills and being able to tell a genuine grill from a fake or altered grill is essential for any collector considering specializing in early United States stamps. 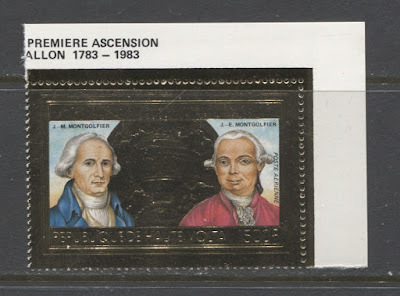 Until acetate mounts and pages with glassine and acetate strips became widely available in the 1960's, the only practical way to display stamps in an album was to "mount" them using hinges. Hinges were made of little rectangles of gummed paper, usually glassine, that were attached to the stamp on one end, and to the page on the other. Of course, moistening the hinge and applying it to the back of mint stamps would leave a mark on the gum of the stamp that cannot be completely removed, though there are experts who are able to cleverly disguise such marks for a fee. 1. Very heavy hinging with multiple remnants can buckle the stamp so that it does not lie flat on the page. 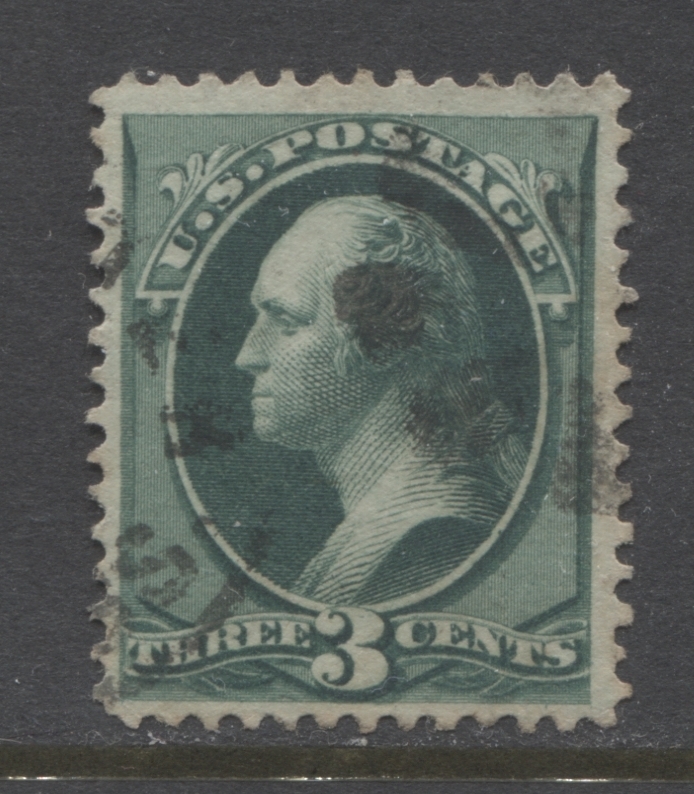 Many collectors find that to them, such a stamp simply does not look as good. 2. Hinging can sometimes be used to hide certain faults like thins or tears. Hinges from the early 20th century were usually made of thick, opaque paper, and were hard to remove. This made them ideal for hiding tears and thins by "patching". It is not uncommon to find several examples of patched used stamps in collections from the turn of the 19th to 20th centuries. My belief is that there is nothing wrong with a hinge remnant, provided that the hinge is a glassine hinge that enables you to see that no damage is being hidden underneath. Where the gum is very fragile and prone to peeling right off the stamps if the hinges are removed, it is definitely preferable, in my opinion, not to attempt to remove the hinges, and to just leave them the way they are. When stamps were first issued from 1840 until 1856, and for most countries until the 1860's, they were not perforated around the edges. They had to be separated either by tearing, or they had to be cut apart using scissors. The above stamp is the first stamp issued by Canada in 1851, known as the "Threepenny Beaver". It had no perforations. Such stamps are referred to as "imperforate" by philatelists. Increasingly in recent years the sheet margins of most issues have contained inscriptions that give details of who printed the stamp, who designed the stamp, what the stamp depicts and so forth. 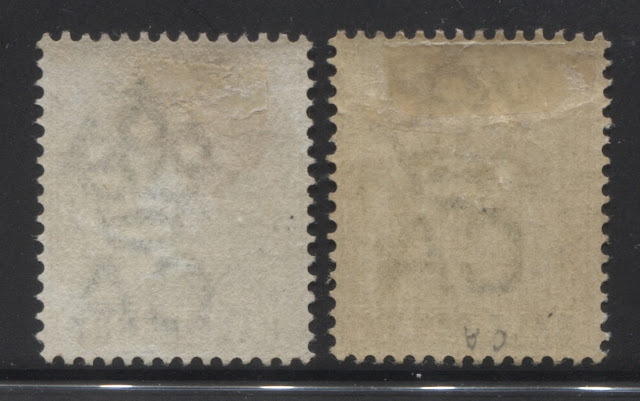 A block of 4 stamps showing these inscriptions is called an inscription block. If it also contains a plate number, then it is a plate block. Inscription blocks now are usually found on all four corners of a post office sheet, though in the very distant past, prior to the 1970's they were often found in only one corner of a post office sheet, due to the fact that post office sheets were often mere portions of much larger sheets that were printed of between 200-600 stamps. An integral booklet is one in which the booklet pane has been attached to the booklet cover directly by its selvage tab instead of being stapled or sewn to the cover. These types of booklets first began to appear in some countries during the late 1960's and are now the principal format in which stamp booklets are produced. On a large number of British Commonwealth stamps, there was a coloured border printed around the outside margins of the sheet in the main colour of the stamp. This border is called a "jubilee line". The purpose of the line was to enable the printer to assess the evenness of the plate wear. Sometimes, as in the case of the above block, the line is continuous. Other times, the lines were broken, with the breaks occurring in between the stamps. The term "keyplate" has come to be used to refer to any typographed definitive stamp that utilizes a common design. Most of these are the definitive stamps issued by the various countries of the British Empire between the 1870's and about 1960. However, technically, a keyplate stamp is one in which a common design, is left blank at the country name and value tablets, which are inserted later, by a separate operation through the printing press. 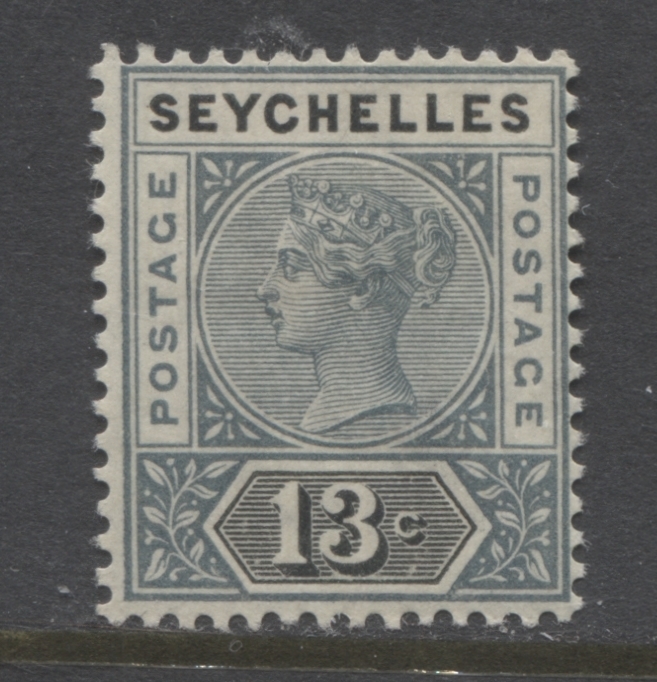 The above bicoloured stamp from the Seychelles, issued in the late 1890's is an example of a true keyplate stamp. Laid paper is a type of paper that exhibits parallel lines, almost resembling a watermark, that run in either the horizontal, or vertical direction. The lines arise due to the wire mesh over which the paper pulp is laid as the paper is being pressed and dried. Most laid paper up to the late 1800's was handmade, though by the late 1800's machines were able to produce laid paper. The stamp on the right hand side in the above scan, issued by Russia is printed on laid paper that shows very visible horizontal parallel lines. There are only three of these known to exist in the world, with this one having been discovered just a few years ago. It is worth several hundred thousand dollars. When stamps were first perforated the main method used was to perforate 1 row and 1 column of the sheet at a time, using pins arranged on a wheel. The sheet was fed through the perforator while the wheel rotated, producing the perforations. However, quite often, when perforating a row or column and intersecting another row or column of perforations, it was quite common for the pins to either miss, or double punch the holes. Very seldom would the rows and columns ever meet perfectly. This can best be seen by looking at blocks and observing the appearance of the perforations at the areas where the columns and rows intersect. 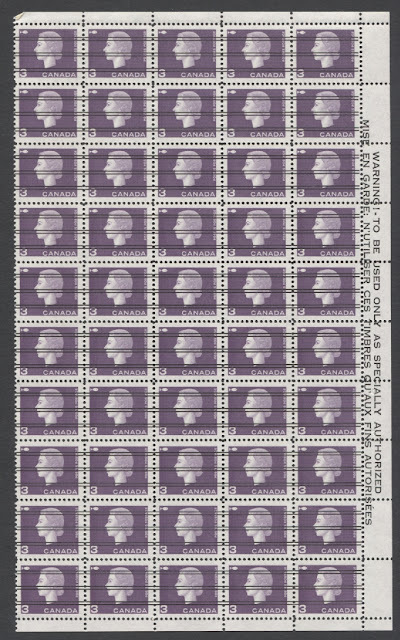 Interestingly, the above block shows both a corner where the perforations line up perfectly in the centre, and then one on the right where they do not line up at all. It is this feature that indicates that the block is line perforated. If you place two line perforated stamps directly on top of one another, the perforations will never line up perfectly on all four sides, whereas comb perforated stamps will always line up exactly on all four sides. Both types of perforations have been around since the late 1850's, so line perforating is not older than comb perforating, even though comb perforations were not in general use in some countries until the 1970's. A manuscript cancellation is any cancellation which was made using strokes of a fountain pen or other type of pen. While manuscript cancellations very often are indicative of revenue, as opposed to postal use, there are many countries in which hand-stamp cancellations were not available for a period of time, and the predominant cancellation device in use was a pen. This is the case with the stamps of Chile for example, which more often than not are pen cancelled. The above stamp is an early stamp from Spain with a manuscript cancellation. For many, many years, manuscript cancellations were considered to be much less desirable than hand-stamped cancellations. However, this is no longer the case, particularly as the demand for better quality stamps has made many high quality stamps with manuscript cancellations very desirable and sought after. However, many, many stamps that had manuscript cancels were often cleaned and re-gummed to resemble mint stamps. A monogram is a pictorial symbol found in the margins of a sheet on some stamp issues. Usually, it consists of the initials of the printer or printing company. For example the above monogram is the log for Cartor, a printing firm located in France. The most famous monograms are those of the early Kangaroo Issues of Australia, which consisted of a fancy stylized "JBC" which stood for J.B. Cooke - the main firm that was responsible for printing the Kangaroo and Map issues at the time. Monograms have become highly collectible and are usually sought out as singles or blocks with the monogram attached, like the above stamp. The presence of a monogram can be worth anywhere from a few cents, to many tens of thousands of dollars. Many late 19th century US stamps were printed in larger sheets that were cut apart into smaller panes, with the result that the stamps along the inside edge of each pane had no perforations on 1 or two sides. 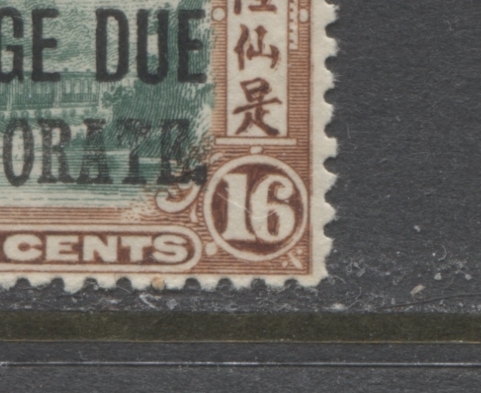 Usually, but not always, traces of a cutting guideline can be seen along the edge, as is the case with the above stamp, which indicates clearly that it is a natural straight edge, rather than simply a damaged stamp. 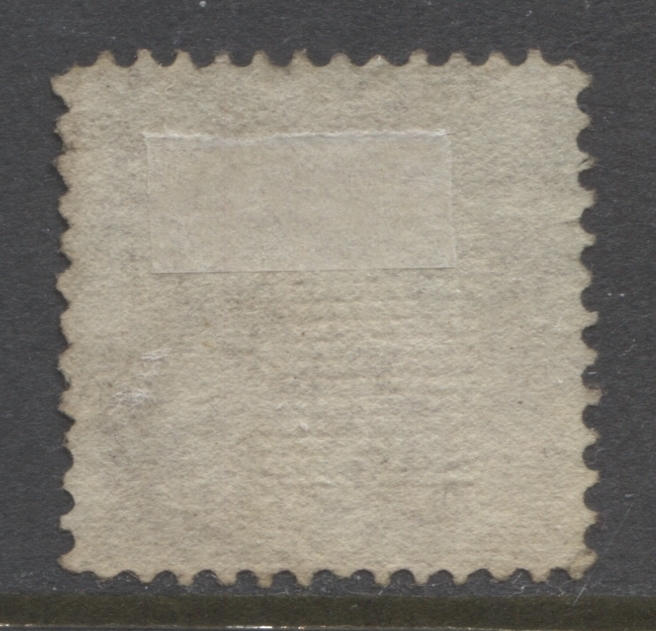 Straight edges are another type of stamp that until very recently were considered by most philatelists to be less than desirable. I'm not sure why, considering that booklet stamps usually have straight edges, and these did not suffer from the same stigma. 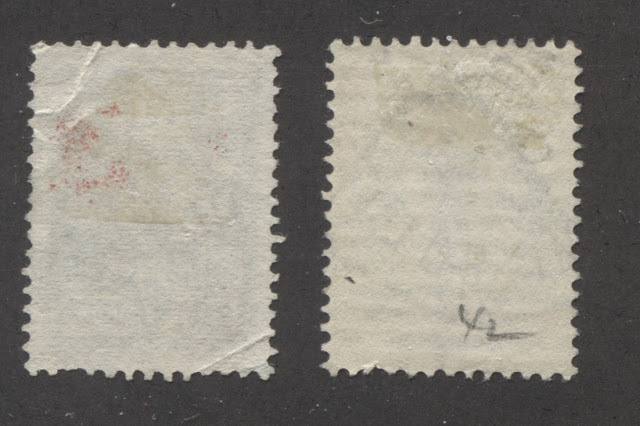 I guess it was due to the lack of visual symmetry, but many high value stamps from this period with straight edges were re-perforated to eliminate the straight edge. Consequently, students of these issues who are genuinely interested in reconstructing the plate layouts find it quite difficult now to locate all the straight edged examples they need. Newspapers are considered to be a form of "printed matter", which was always conveyed through the postal system for a much less expensive rate than lettermail. 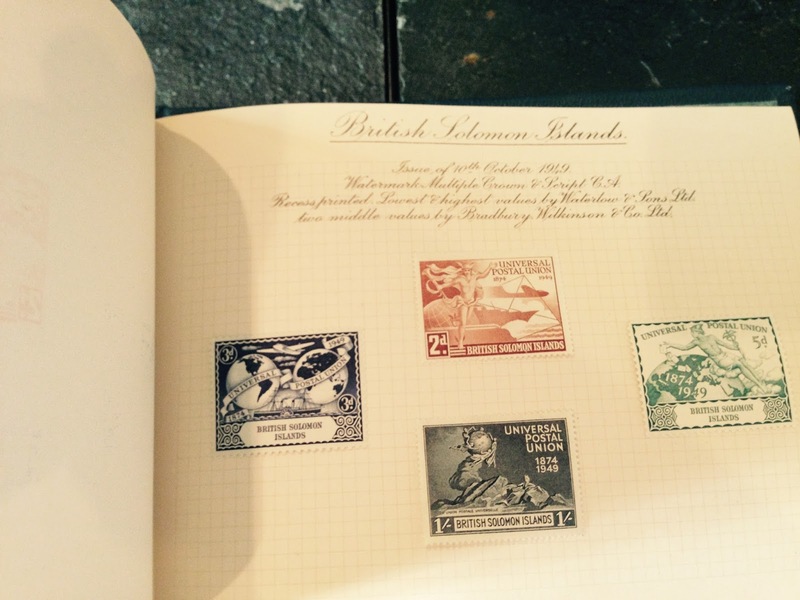 Most countries did not issue separate stamps for use on newspapers. 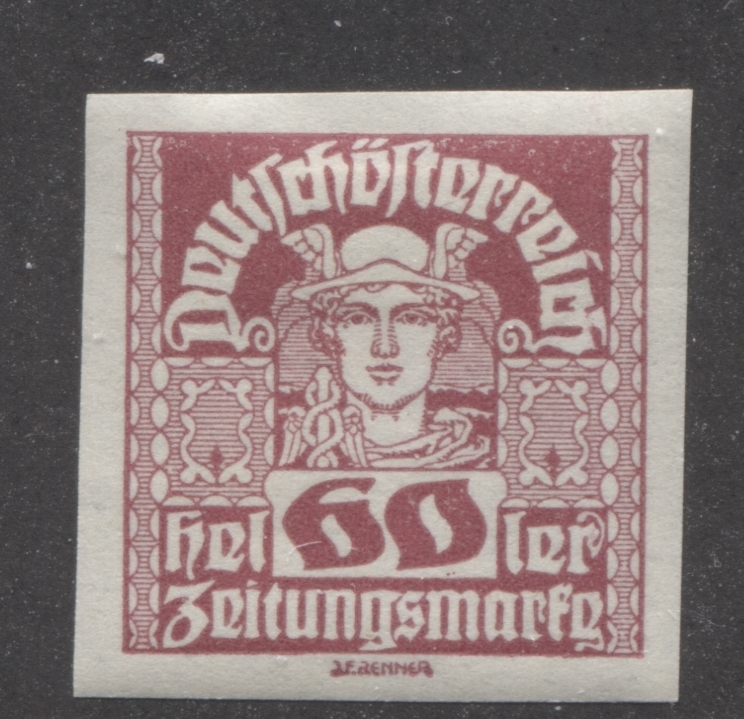 However, many European countries did issue such stamps, and example of which is the Austrial stamp shown above. 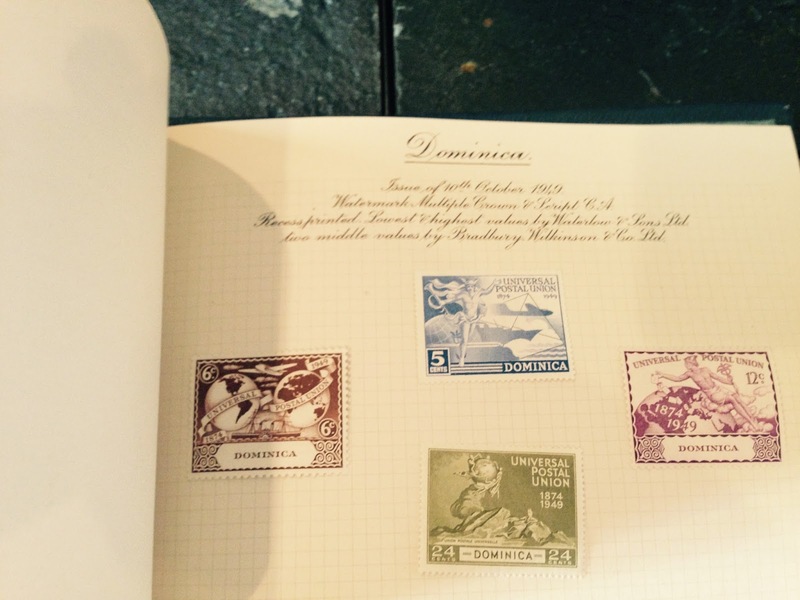 An omnibus issue is one in which several countries have participated in issuing stamps. Quite often, though not always, a common design is used, with only the country name being changed. The above scans show the common design that used by the Crown Colonies of the Commenwealth to celebrate the 75th anniversary of the UPU. 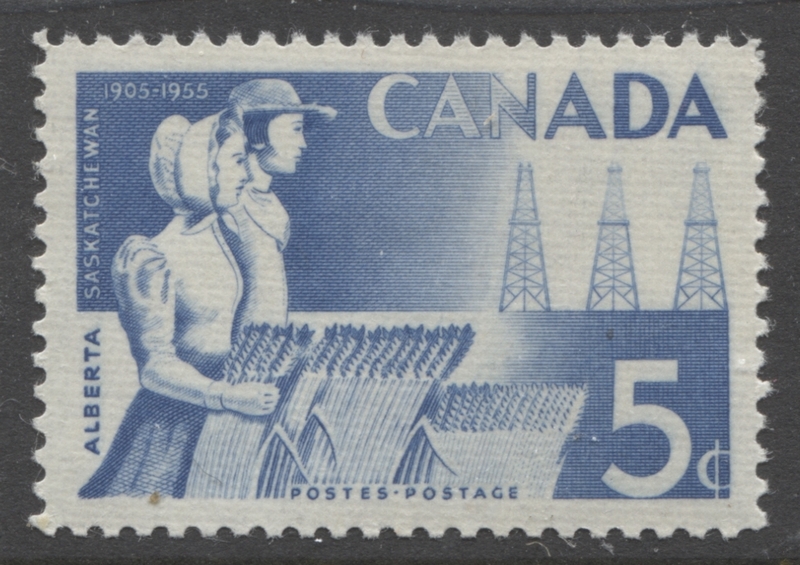 This issue in fact was issued worldwide in 1949, with many countries utilizing their own design. The Crown Colonies of the commonwealth utilized a series of four common designs, which are shown above. Occasionally some printing firms had a system of keeping track of the order in which plates were laid down and put into production by recording a number in the outside selvage of the sheets. This number was usually incorporated into the plate inscriptions on a sheet. In the above example the number at the top left of the selvage of the block, number "572" is the order number. 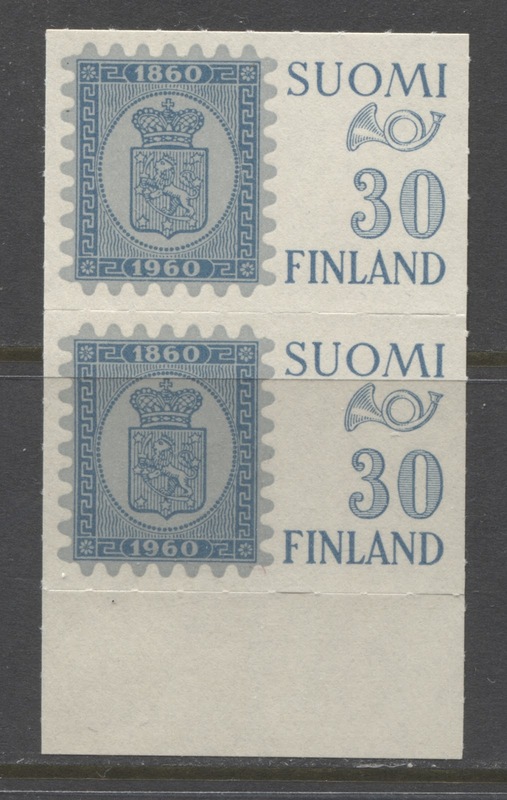 These numbers are useful to collectors because they provide some information about which stamps were printed first before others. For example, if a collector is studying all the different printings of a definitive series then by comparing the order numbers of some blocks of the definitive stamps to the order numbers of commemorative stamps issued during the period that had known issue dates, that collector can get some idea of when the definitives were printed. 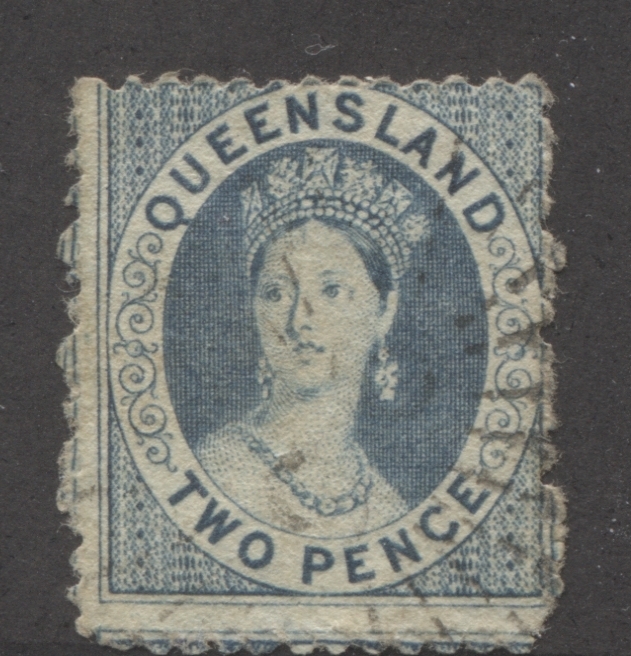 The term overprint refers to any marking that has been added to a stamp design after the original printing was completed. In the above example, a "G" has been printed on top of the original design to designate these as being for governmental use only. A specialized type of overprint in which the face value of the stamp is either raised or lowered is called a surcharge by philatelists. Overprints as a group comprise a very troubling field for philatelists, as many are rare and as a general rule, many have been extensively forged, often very well, so that proving the authenticity of the overprint can be a major concern for philatelists. 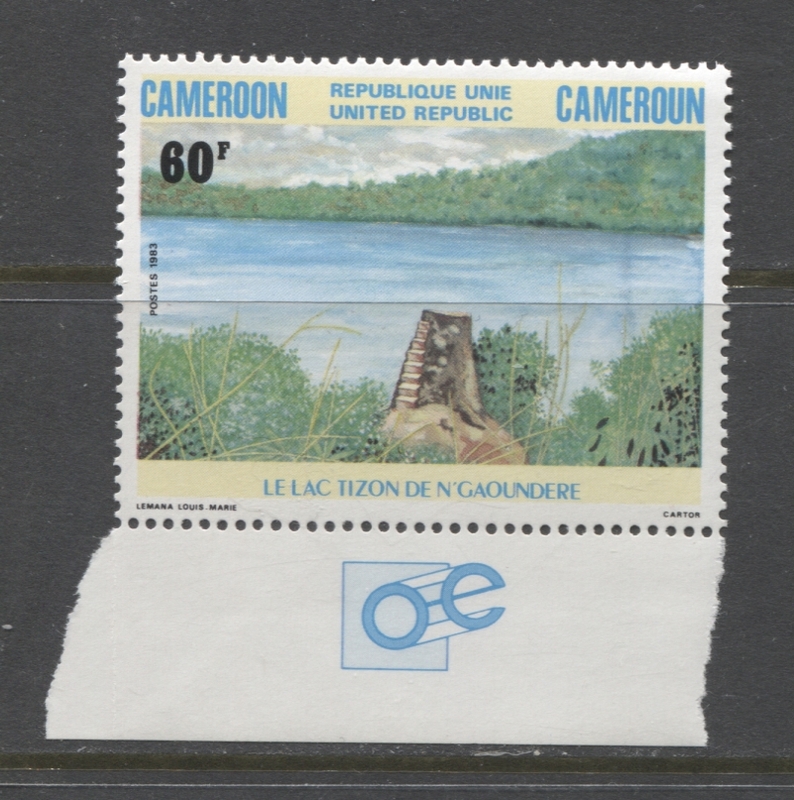 A complete unit of stamps, undisturbed and in the original format in which is was sold, is called a pane. 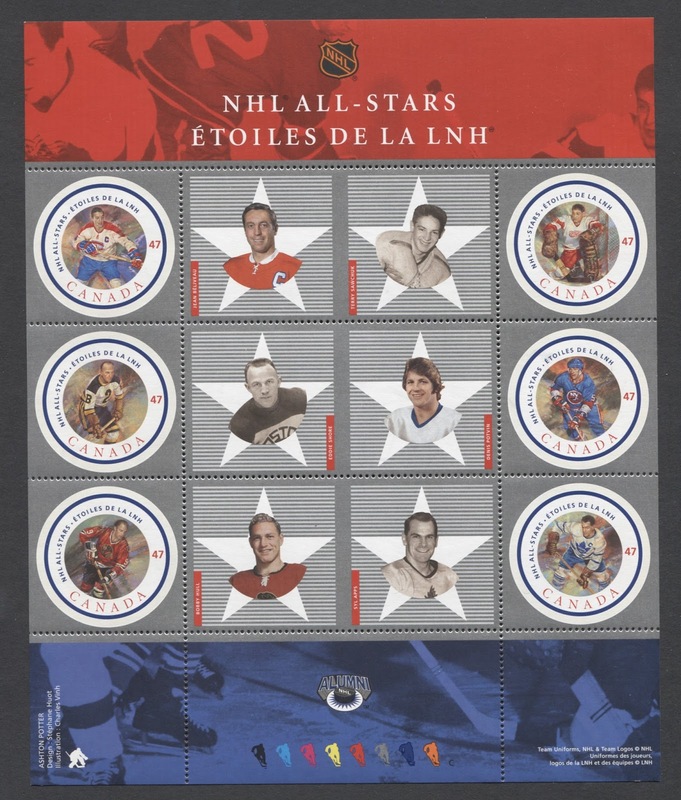 The above NHL Hockey Issue from 2001 is an example of a pane, as this was the only form in which this stamp was issued, and the sheet is complete. This is different from a "sheet", as sheets were the unit produced by the printer and not necessarily what was sent to the post offices. For example, a sheet of the above issue would consist of several of the above panes. 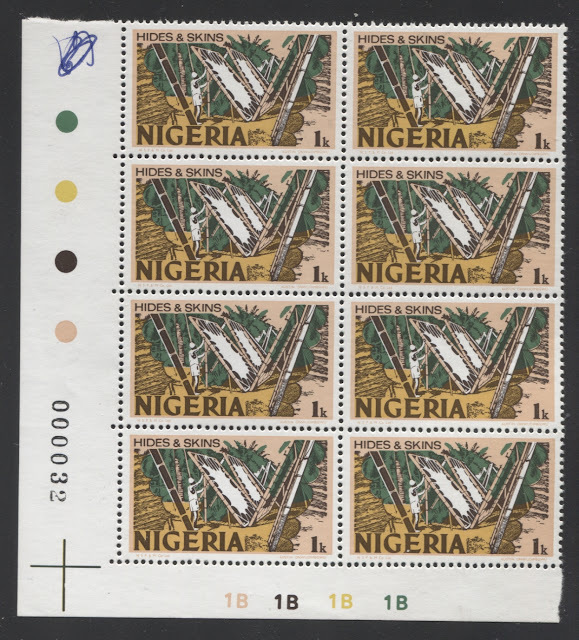 A block of stamps is a unit that consists of at least 3 stamps arranged in at least two columns or two rows, but which is not the size of a pane. 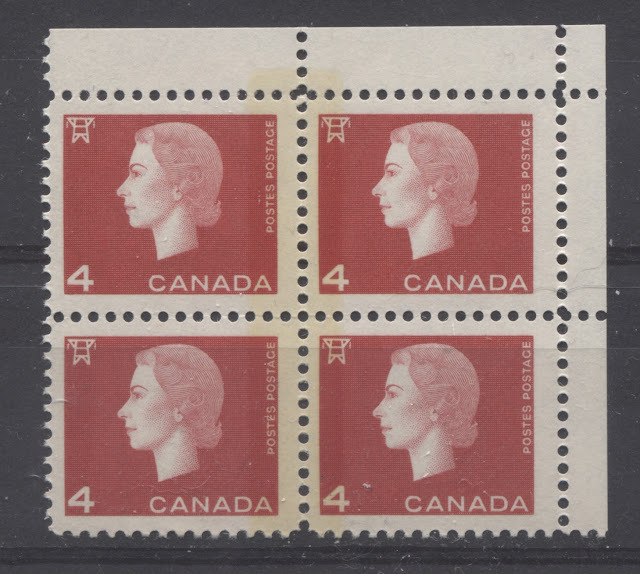 So if the above pane was missing the bottom two stamps, it would be a block of 4. A strip is three or more stamps that are in a single row or column. Either column of the above pane is a strip of 3. A pair is just two stamps joined either vertically or horizontally. Parcels were generally carried through the regular postal system at much higher rates than regular letters. Most countries simply affixed higher value definitive stamps to make up the postage rates. 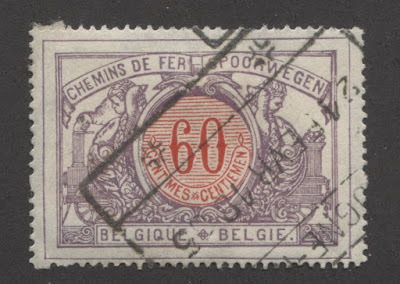 However, in many Western European countries, such as Belgium, which issued the above stamp, separate parcel post stamps were issued. Generally speaking, most of these are quite common in used condition, but are very scarce in mint condition. They were not commonly used in the British Commonwealth, and they were only used for a very limited period in the US from the late 1910's to about 1930, before being discontinued. Pelure paper is a type of very thin, hard and transparent paper that is found on some stamps from the 19th and early 20th century. It's defining characteristic is its thinness and translucency, as shown in the Bulgarian stamp shown above. There is a special type of pelure paper that was used by Prussia in the 1860's that is referred to by collectors called "Goldbeater's Skin". 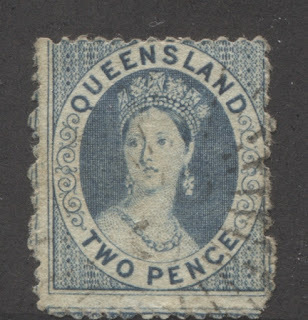 Stamps on this type of paper were printed in reverse on the back of the stamp underneath the gum. Consequently, the design begins to disappear when the stamps are soaked off the envelope to which they were affixed. Pelure paper is not a very common paper in British Commonwealth philately. 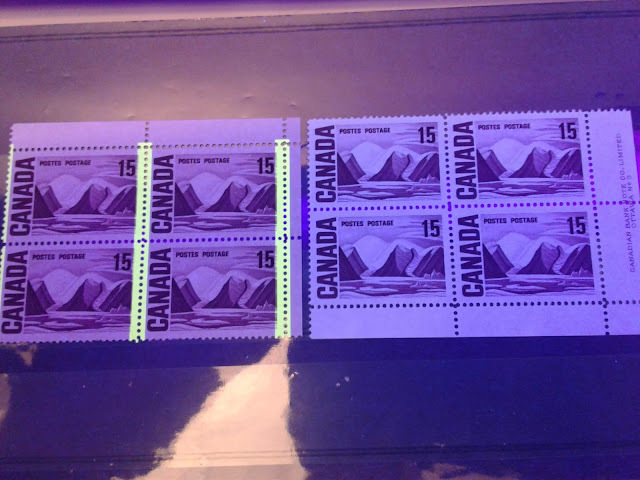 You will encounter it on some of the early stamps of New Zealand and the Pence Issues of Canada, where philatelists call it "thin oily paper" on account of its translucency. 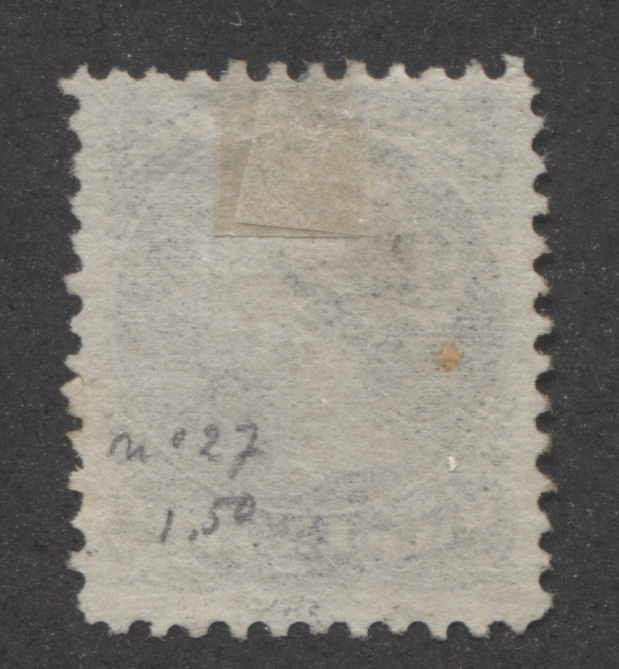 It is a much more common paper in Eastern European philately, particularly on the stamps of Poland and several other countries. A perforation gauge is a device used to measure the number of perforation holes in a distance of 2 cm for a particular stamp. An Instanta gauge, like the one shown above consists of a plastic strip, onto which has been printed a grid, which measures the number of pins in a given distance, calibrated to the nearest tenth, with the lowest measurement being 9.8 and the highest being 18.2. To use it, you simply line up the first vertical line at the left side of the gauge, called the guide line, with the first perforation teeth at the top and bottom edges of the stamp, so that the line exactly bisects them and move the gauge until each perforation tooth at the top is exactly bisected by a black line. The reading on the right side of the gauge gives the exact measurement. that used optical scanning technology. A method had to be devised to enable the machine to "see" the stamp on the envelope. 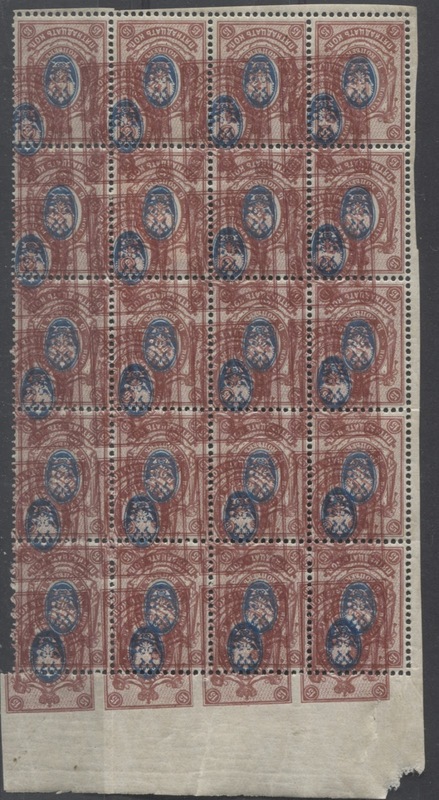 The solution adopted by a number of countries was to overprint stamps with an inconspicuous chemical taggant that would be visible to the machines. 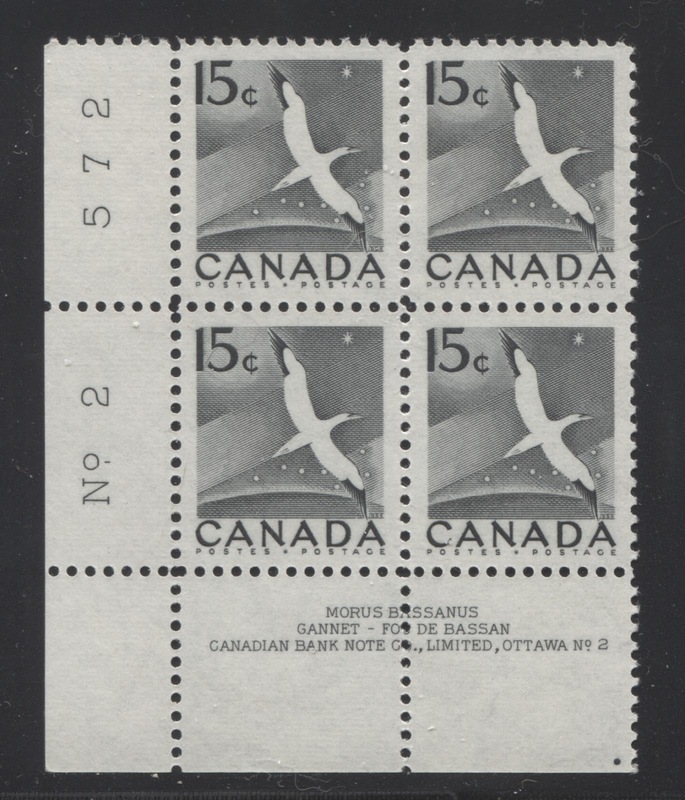 The block of four of the 1962-1967 Cameo issue above shows a single band of this taggant running down the middle of the block. Most tagging like this at least in the late 1950's and early 1960's was phosphorescent, which means that it glowed when exposed to either short-wave ultraviolet light (the dangerous kind), or long wave ultraviolet light. Phosphorescent chemicals would also glow for a few seconds after the light source is removed, whereas later fluorescent tagging will stop glowing immediately after the light source is removed. A plate block is simply a block of stamps in which the plate number appears in the sheet margins, which are also called selvage. The above block of 4 halfpenny stamps from Lagos, issued in 1901 shows the plate number 2 inside a solid ball of colour. A plate flaw is a stray marking that is not part of the intended design, that appears on a stamp after printing. Plate flaws usually result from damage to the printing plate, such as scuffs or dents, and even pitting caused by corrosion. However, they can also be caused by over-inking or splattering of ink. 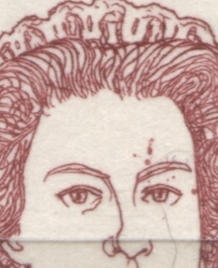 The above 10c Queen Elizabeth stamp is from a stamp booklet that was issued as part of the 1972-1977 Caricature issue. The spots above the eye, next to the eye and above the eyebrow are not part of the design and these constitute a plate flaw. 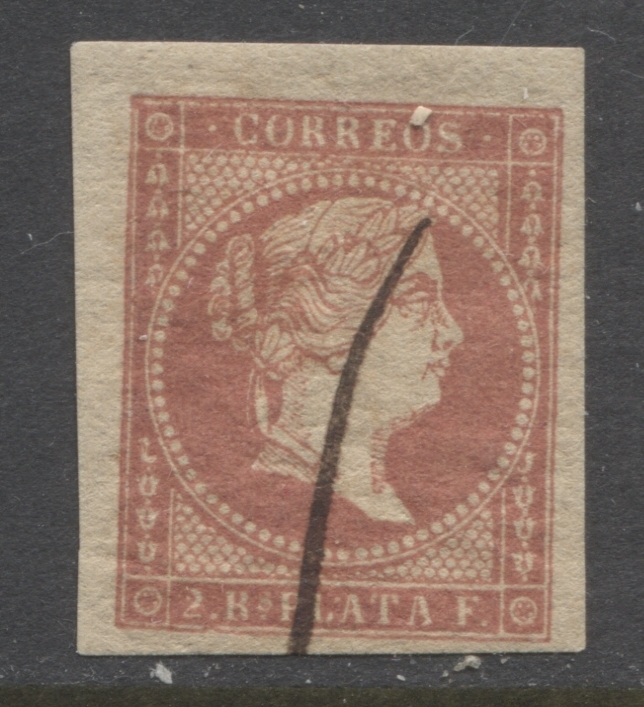 The most desirable plate flaws from the perspective of a collector are those which are constant, which is to say that they occur in the same stamp from every sheet printed. These types of flaws are always caused by damage to the printing plate and will generally persist until they are corrected by repairing the damage to the plate. 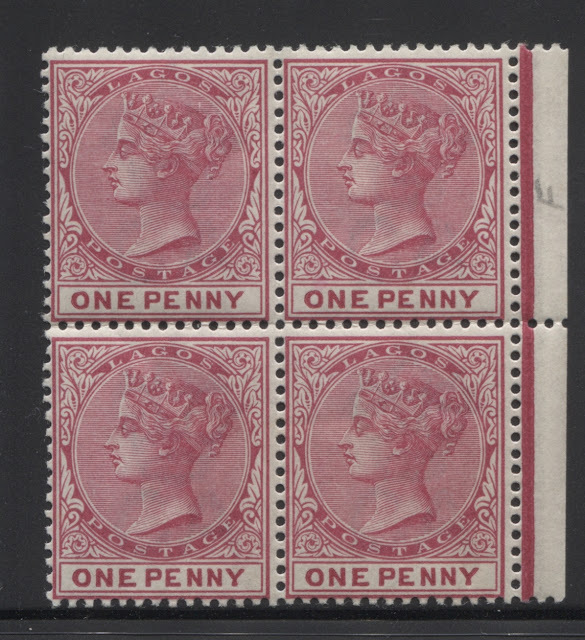 One of the reasons why they are so desirable to specialists is because they can provide proof of a stamp's position on a sheet as well as proof of a particular printing. The plates used to print stamps were produced using what is called a transfer roll, which was essentially a cylinder of steel onto which the master design was copied and which was then transferred to the new steel printing plate. The production of the plate is known as the "laying down of the plate", and it is a job that was done by a person known as a sideographer. Occasionally the sideographer would make markings, often in the form of a cross on the plate to assist them in judging distances or other things. Usually, these markings were burnished off the plates before printing, but occasionally they were not, and you can find these guide markings on individual stamps. 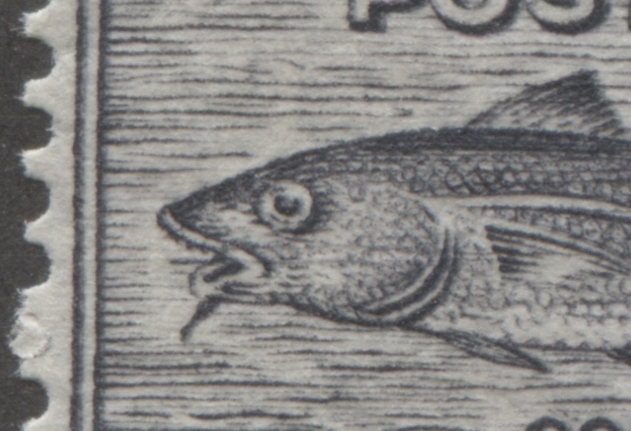 The 1c codfish stamp from the 1937 Coronation Issue of Newfoundland, shown above, has one such cross marking just visible inside the mouth of the fish. It is known to collectors as the "fish hook variety" and is highly sought after. Today if you fail to attach enough postage to an item you are sending through the mail, and this deficiency is caught by the authorities, the item will never reach its intended recipient, and will instead be returned to you. However, such was not the case until relatively recently in the 1980's and 1990's. Prior to this time, most countries utilized a system of taxing items that were shortpaid with double the deficiency and collecting the money from the recipient. 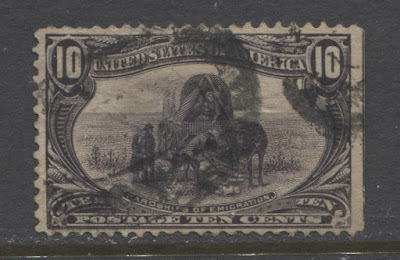 Postage due stamps were affixed to such items to denote the amount of postage that the recipient was required to pay in order to pick up the item. 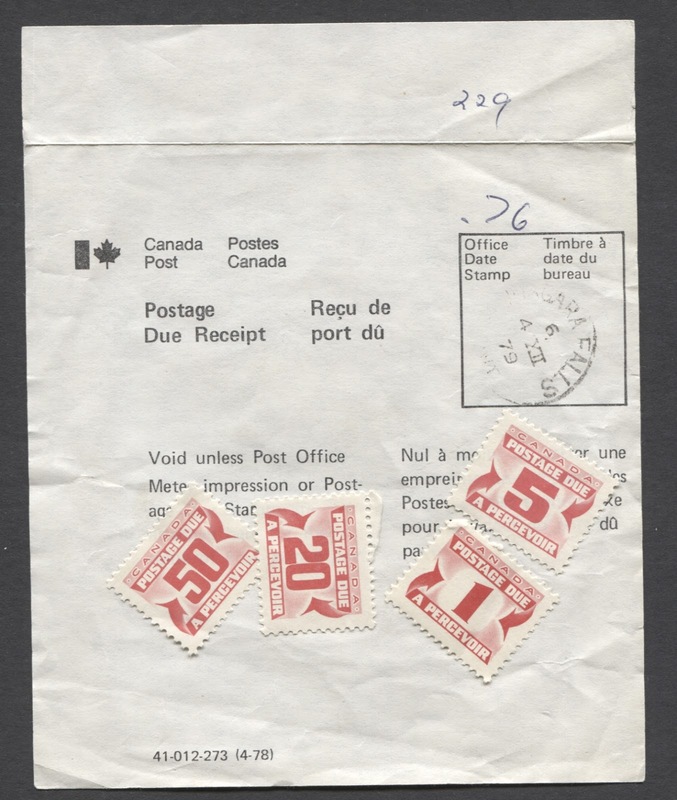 Occasionally, the stamps would be affixed to a receipt that would be left at the recipient's address, along with the item, and instructions to pay the deficiency at the post office, as shown above. The system for taxing deficient postage on international mail was developed in Switzerland and is interesting in and of itself. The country from which the item was being mailed, if it caught the deficiency would mark the item with a "T" in an handstamp usually. This symbol was universally recognized by UPU member nations as indicating that an item was shortpaid. Often, the deficiency in local currency would be indicated on the envelope as well. However, the postage due stamps would be affixed in the recipient country, which used a different currency in most cases. So what would usually happen is that the clerk in the recipient country handling the item would convert the deficiency into a common currency, which for the postal system was Gold Francs and Centimes. This amount would then be doubled and converted back to the currency of the recipient country, and then the appropriate amount of postage due stamps would be affixed. A postal fiscal is a revenue stamp that was authorized for a period of time to be used for postage. 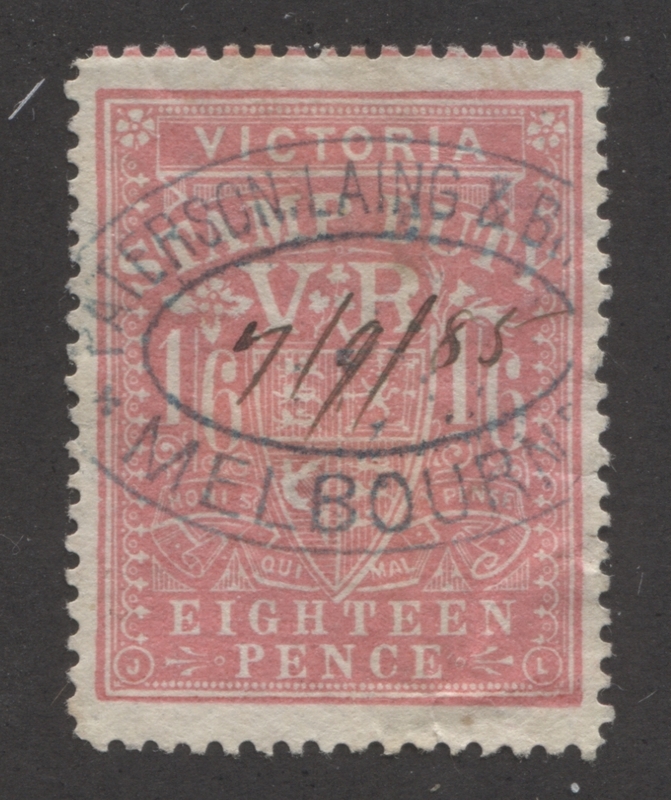 Victoria and most of the other Australian states prior to 1901 and New Zealand both authorized many of their revenue stamps for postal use. 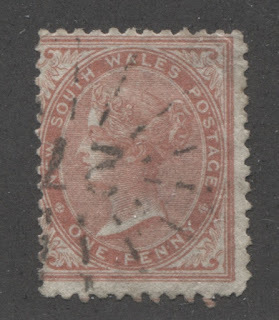 Most used examples that are found in collections, such as the one shown above do not show evidence of postal use, but rather are simply used as revenue stamps, in which case they are much more common than the catalogue prices would suggest, and consequently are worth much less. 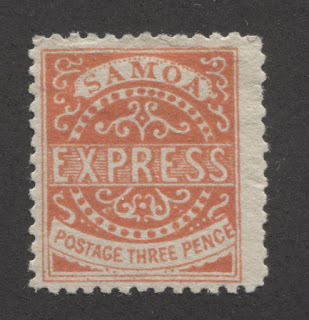 In mint condition, many of these stamps are quite rare and valuable, as the majority of them were used up and the printings were relatively low. A precancel is a stamp on which the cancellation has been applied in the form of an overprint, by the post office prior to the sale of the stamps. The first precancels appeared in the 1880's and very closely resembled regular cancellations. Later, the precancels were distinctly different and appeared in the form of vertical or horizontal bars, like the stamp shown above, town names between bars, numerals between bars and many others. They were issued as a means of saving labour, since they did not have to be cancelled after use. However, they were not sold to the general public, but only to organizations that had a permit to buy them. Part of the reason for this is that they were sold below face value usually. Printer's waste is a generic term given to the many misprints and errors that occur during printing. Most security printers have very strict rules in place to ensure that printer's waste does not get released, and is rounded up and destroyed. However, occasionally, an error will get released accidentally and sold to the general public inadvertently. These items are what purists call "errors". Items where there is no evidence that they were ever sold to the public generally fall under the category of "Printer's Waste". The block from Russia above, shows an erro in which a second impression appears haphazardly printed over the first image. This is likely printer's waste that was never released to the public. In a lot of instances printer's waste is very striking, but is not usually very valuable compared to actual errors that were sold to the general public before being discovered. When a stamp is in production, the design and printing are subjected to several levels of vetting an approval before the final order is made to print the stamp for distribution to post offices. Proofs are the printings made for distribution to those doing the vetting at each stage in production. At the beginning of production, when the stamp's die is being produced, a "die proof" which consists of a single impression on a card, is made and sent for approval. Once this is approved, the die is used to produce a plate, and from that one or two sheets are usually printed, and the singles from these sheets are then distributed to those whose job it is to issue the final approval. These types of proofs are called "plate proofs"
The above card shows four plate proofs from the 1973-1986 definitive issue of Nigeria. This card was reviewed, signed off and this would have been placed in the printer's archives to evidence that the correct approvals were obtained before printing was completed. Engraved stamps are printed from large plates that have been made by taking an impression of the stamp, transferring it to a steel die and then rocking that die back and forth under very high pressure on a soft steel plate, which is then hardened after the plate has been produced. During this rocking process, occasionally parts of the design will be doubled as a result of the rocking motion. This is called a "re-entry". 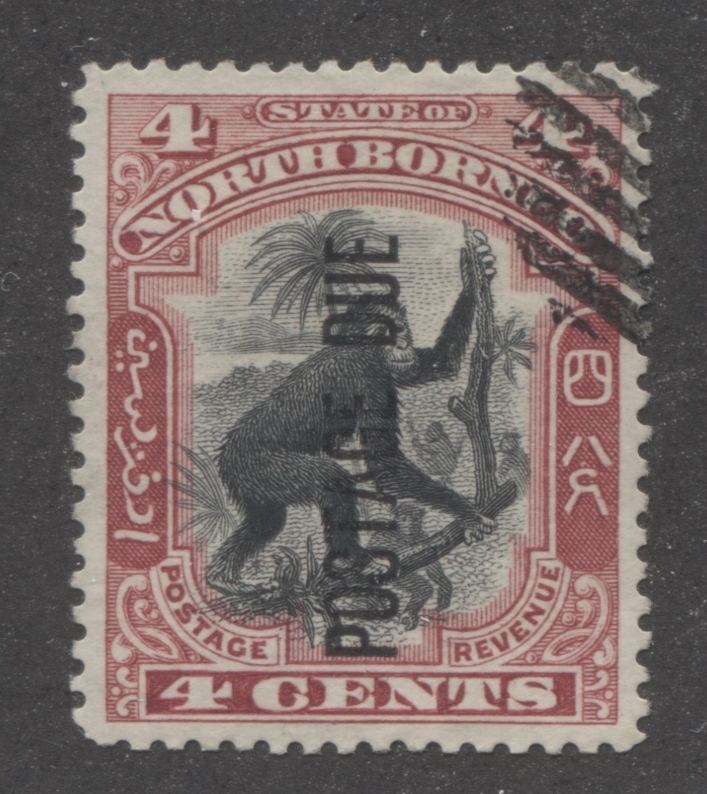 The above stamp from North Borneo shows distinct doubling of the lower right corner as well as the "6". 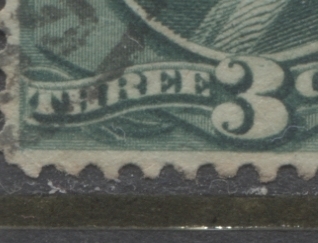 Re-entries can vary in scarcity from very common, where virtually every stamp on the plate shows some minor doubling, to very rare, where only one position on the plate shows extreme doubling of most components of the design. Registration is a service offered in most countries, in which a letter, or parcel is tracked through the postal system. A registered item is assigned a specific identification number so that it can be tracked through the postal system, which is supposed to provide some additional security over the item and reduce the chances of loss, though it also provides proof of sending. Thus in the 19th century, most registered letters either contained important legal documents, or money. In those days, their registered status would be indicated by a handstamp that would say "R" or "Registered", or the cancellation itself would indicate the status. The identification number of the item would also appear right on the front of the envelope in pen. Quite often the number would change as the letter made its journey through the system, in which case you will see several numbers on the envelope, with the earlier ones crossed out. In recent years, self adhesive labels are attached to the envelope that bear the letter "R" and have the tracking number and a barcode printed right on them. This is generally scanned by an optical reader at several transition points along the item's route, and the information gets uploaded to the post office server. This allows the sender, or the recipient, who has the tracking number to go online and actually see where in the system their item is, and approximately when they can expect to receive it. There is a common misconception that registering a mail item makes it pass through the postal system faster. This is NOT the case. All registration does is provide a record of the items journey through the postal system. The risk of loss is only lowered because the tracked nature provides some deterrent against theft. However, registering an item does not eliminate the risk of damage through accidents nor genuine accidental loss. The increased security and handling means that most registered items actually take longer to reach their intended recipient. When a quantity of stamps sent to a colony or issued by a country remain unsold when the next issue is released to replace them, the unsold stamps are called remainders. Most of the time the remainders are withdrawn and destroyed. However, there have been some instances during the 19th century when remainders were sold to collectors or in bulk to stamp dealers who used them as packet fillers. 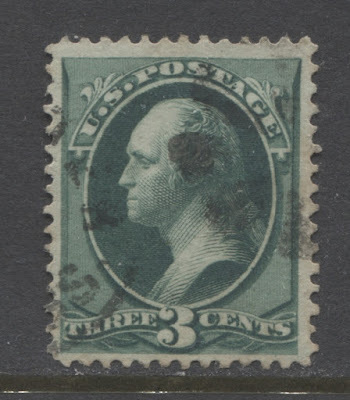 In many instances those remainders were left in mint condition, but in some instances, the postal administration selling them applied a distinct cancellation to invalidate the stamps because they were being sold for much less than face value. 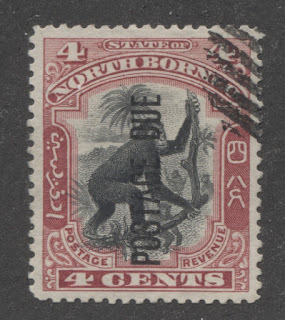 Both Labuan and North Borneo were two such territories in which this was done. 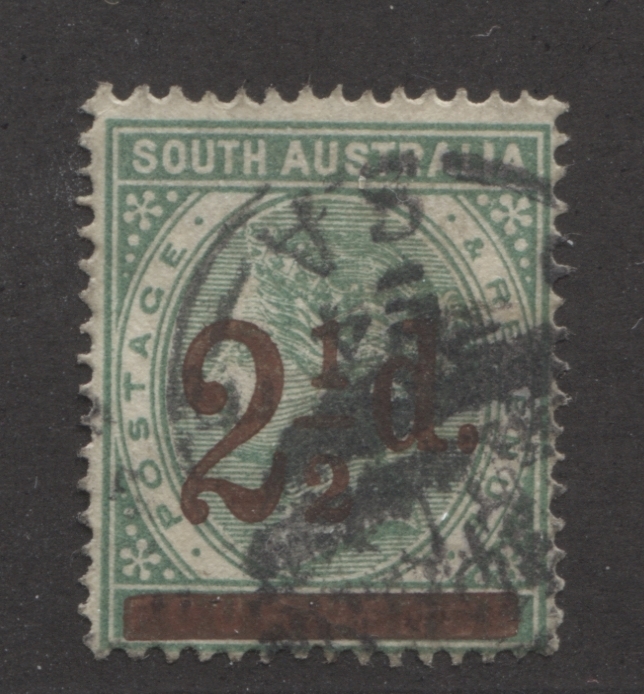 The cancellation used for this purpose was very distinct and was never used postally. Most of the time these types of cancellations, often referred to as remainder cancellations, are applied to the very corner of the stamp designs, so as not to deface the stamp too much. 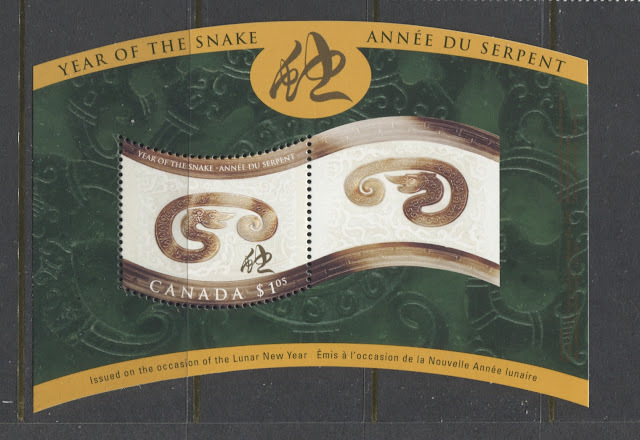 It is the care with which these were consistently applied that gives away their true nature, since cancellations during this period were generally designed to completely deface stamps. A reprint is a printing of a stamp that was made after the original stamp had ceased to be current, often as long as 20 of 30 years after the fact. Many issues of the 19th century around the world were re-printed between 1880 and about 1915. These reprints can either have been done by the postal authorities, or private individuals. 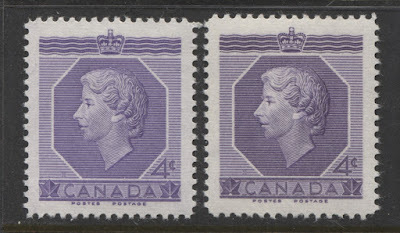 Usually, but not always, the reprints are very common compared to the original stamps and are worth very little compared to the original stamps. The Samoa express stamp shown above is perhaps one of the most famous examples of this type of reprint. 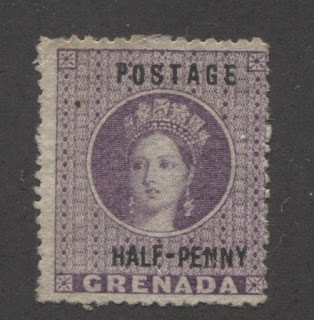 These stamps are found in just about every old-time British Commonwealth collection and they are so common that usually 90% of the time when you see these stamps, they are reprints. 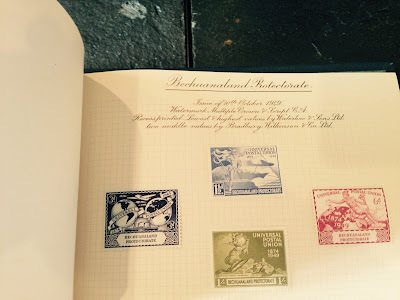 Other areas from the British Commonwealth, where your stamps are very likely to be reprints are Heligoland and Transvaal. China stamps from 1949 to the late 1950's were also extensively reprinted to the point where most examples seen in collections are cheap reprints. The only way to tell reprints apart from originals is usually through minute differences in the design characteristics, paper or ink colour. Sometimes however, reprints can be scarcer, and worth more than the original stamps. That is often the case with many stamps from Portugal and the former colonies of Portugal. A revenue stamp is one that was issued only to evidence the payment of some type of government imposed fee or tax. 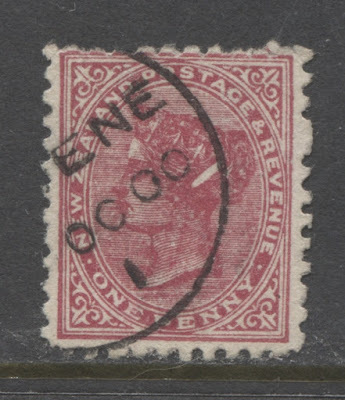 Revenue stamps are not issued for postal purposes. 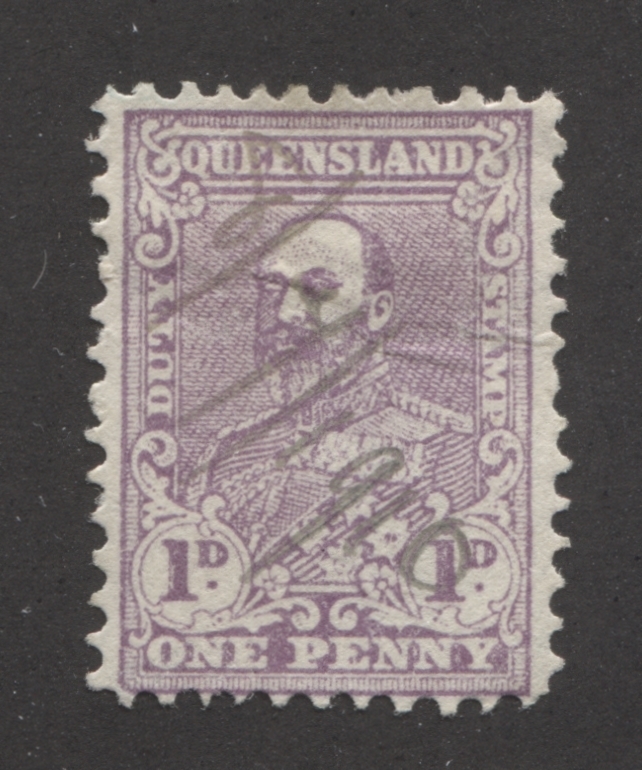 The above stamp from Queensland is inscribed "Stamp Duty", and is an example of a revenue stamp. In practice, most of the high value stamps issued by British Colonies above 1 Pound were actually issued for revenue purposes, even though they are inscribed "Postage and Revenue". As a result, most of these stamps that reside in stamp collections are mint, or revenue cancelled, rather than postally used. Ribbed paper is a form of wove paper that has a distinctly textured surface that runs either vertically, or horizontally across the surface of the stamp. The above stamp is printed on a paper that shows distinct ribbing in the horizontal direction. Such paper is called "horizontal ribbed paper'. 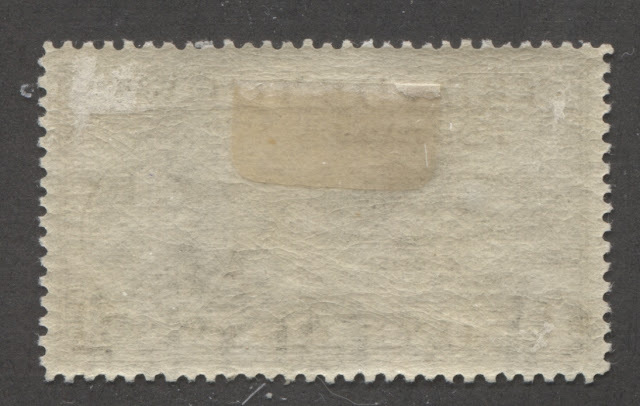 The existence of these rough perforations is a major sore point for condition conscious collectors who are used to even perforations and perfect centering. Many collectors who lack experience with these perforations often think the stamps are damaged, when in fact they are perfectly sound. The above stamp does have a rounded corner at the lower right, but other than that it is sound. A rouletted stamp is one in which the paper has been cut with a series of long horizontal and vertical slits, so that when torn apart, the stamp resembles a dotted line on the edge. The above 1960 issue of Finland is one of the most modern rouletted stamps I know of, with rouletting being confined mostly to stamps issued before 1880. Rust is a form of discolouration that affects stamps that have been stored in humid conditions and which have been exposed to fungal spores. The only way to get rid of the toning is to kill the fungus by soaking in warm, soapy water. The problem with this is that the inks may run if they are fugitive, and the stamps will lose their gum. Still, such things may be preferable to a stamp that has been ruined by the fungus, as it spreads slowly over time if not treated or removed. The above block of a stamp issued by Nothern Nigeria in 1911 is an example of an item that has been severely affected by rust. A secret mark is any aspect of a stamp design that represents a modification from an earlier design that is added by the printer as a deterrent against forgery. 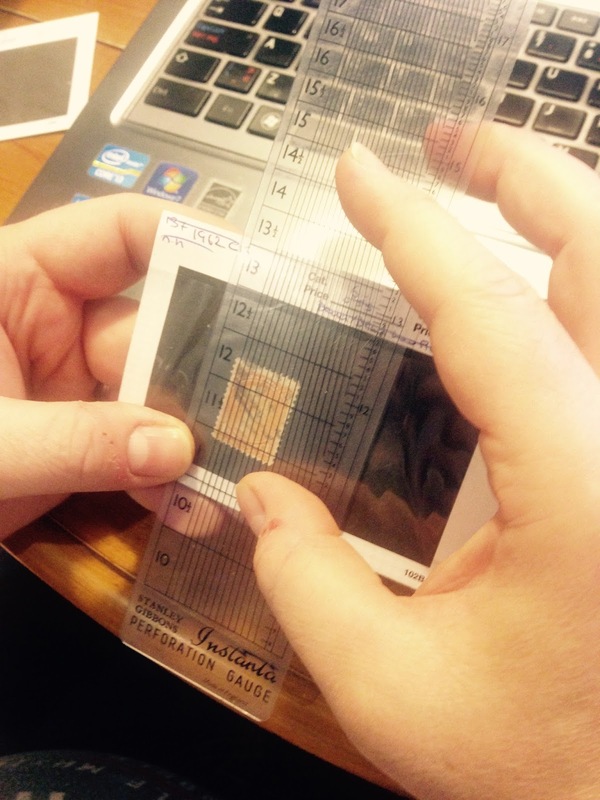 The idea is that the detail is so minuscule, that a forger will miss it and "get it wrong", thus exposing the fraud. Only a few countries that I know of employed secret marks. The US Banknote issues of the 1870's and 80's, as shown above is one example, while the Dr. Sun Yat Sen issues of China in the 1920's and 1930's is another. In the above example, the secret mark is the heavy shading at the bottom of the ribbon that is just below the "R" of "Three". The earlier printings without the secret marks do not have shading that is anywhere near this heavy. 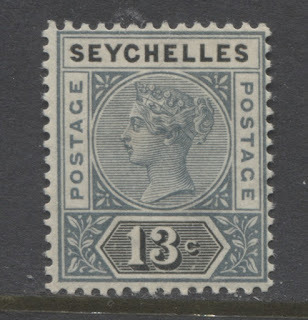 Selvage is the paper found around the edges of the stamp sheets, which does not form part of the printed stamp designs. 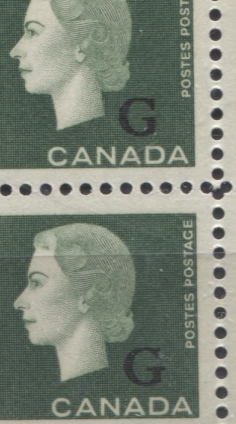 Most of the time the stamps printed in sheets are perforated on all four sides, so that the selvage can be completely torn away from the stamps. The above stamp is an example of a stamp from the outer left hand edge of a sheet, and shows a narrow tab of selvage attached to the left hand side. 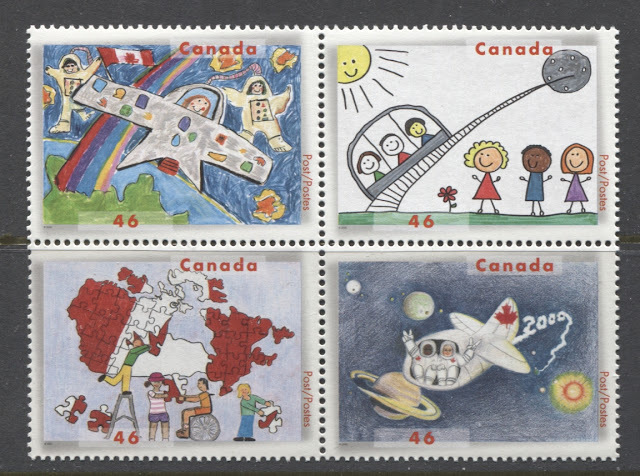 A semi-postal stamp is a stamp that was issued to raise money for a specific cause, as well as for the payment of postage. 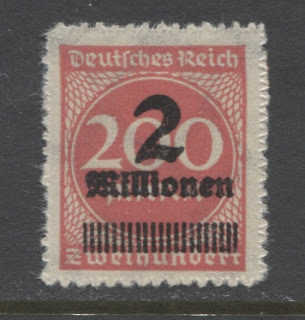 Such a stamp will have two face values shown: one, being the amount of postage that the stamp was valid for, and the other being the amount of money raised by the sale of the stamp. Semi-postals were sold over postal counters for the sum of the two values. 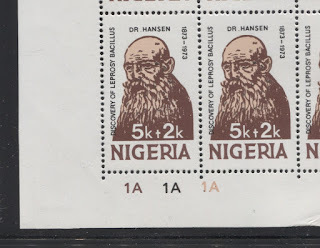 In the above example, which was issued to raise money for Leprosy treatment, the stamps sold for 7 kobo, of which 2 kobo was the amount of money raised and 5 kobo was postage. Semi-postals were quite popular in Europe between the 1930's to the 1950's, with many countries issuing almost as many semi-postals as regular stamps. However, they have not really caught on in North America, probably due to the relatively individualistic nature of our culture. A serrate roulette is a roulette in which the cuts to the paper are rounded, which gives rise to edges that in many ways resemble perforations. The key difference though is that the perforation "tips" are formed through tearing of the paper, whereas on a serrate roulette the "perf. types" do not have a torn appearance and are rounded. 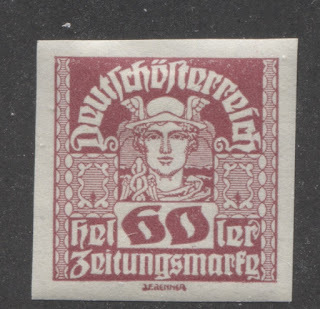 You can see that this stamp from the 1923 Inflation period of Germany is not perforated by looking at the right hand edge where there is still some unseparated paper at the top right. If you look closely, you can see that there are no punched holes, but rather a series of rounded cuts in the paper. Serrate roulette is not a very common form of separation, and it tends to be quite a scarce variety on most issues where it is found, this example above being the notable exception. 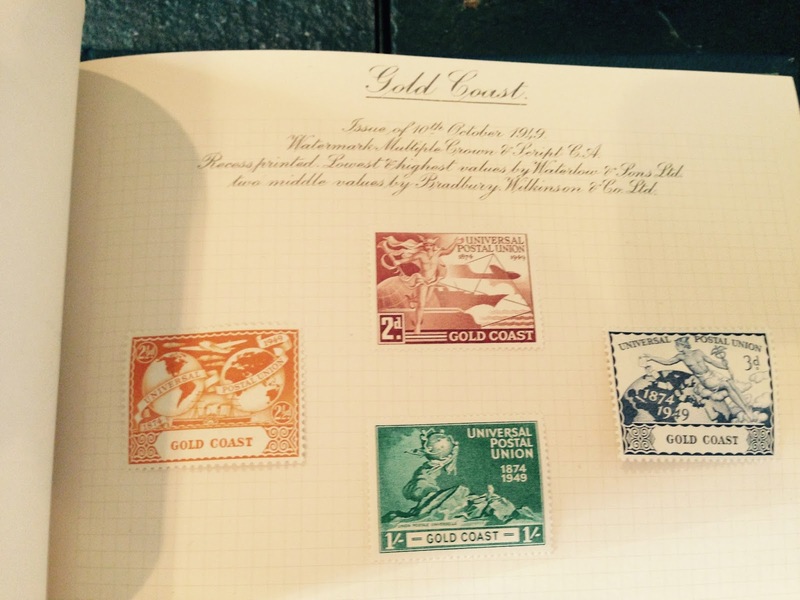 Stamp designs used to be printed one design per sheet, with all stamps in a sheet being exactly the same. Starting in the 1950's many issues, usually commemoratives, consisted of three of four designs, which would all be printed in rotation on the same sheet. These are called se-tenant designs. 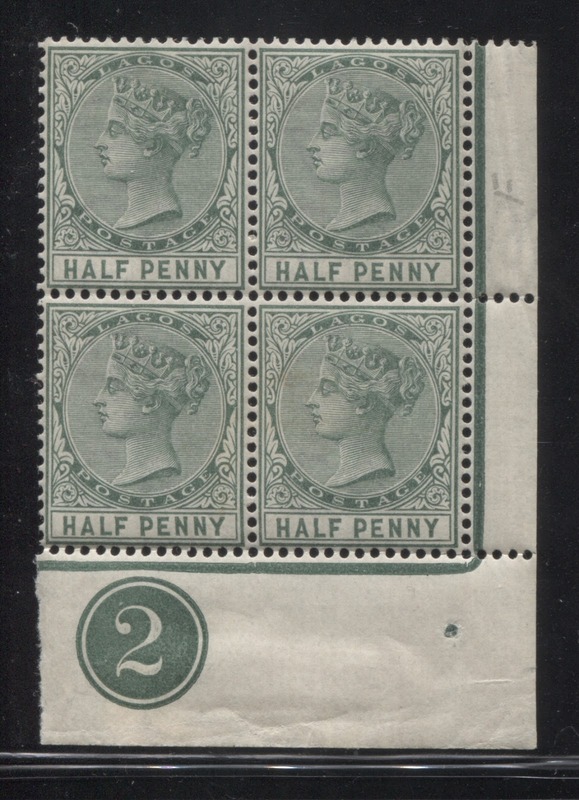 They are not uncommon in mint condition, but properly used se-tenants on cover, used in the proper period of time (i.e. when on sale at the post office) are some of the most challenging items in modern philately. The above scan shows the 2000 "Stampin the Future" issue, which consisted of four se-tenant designs. Until the late 1960's and early 1970's stamps were generally printed from inks that were mixed in batches manually according to some pre-determined formula. 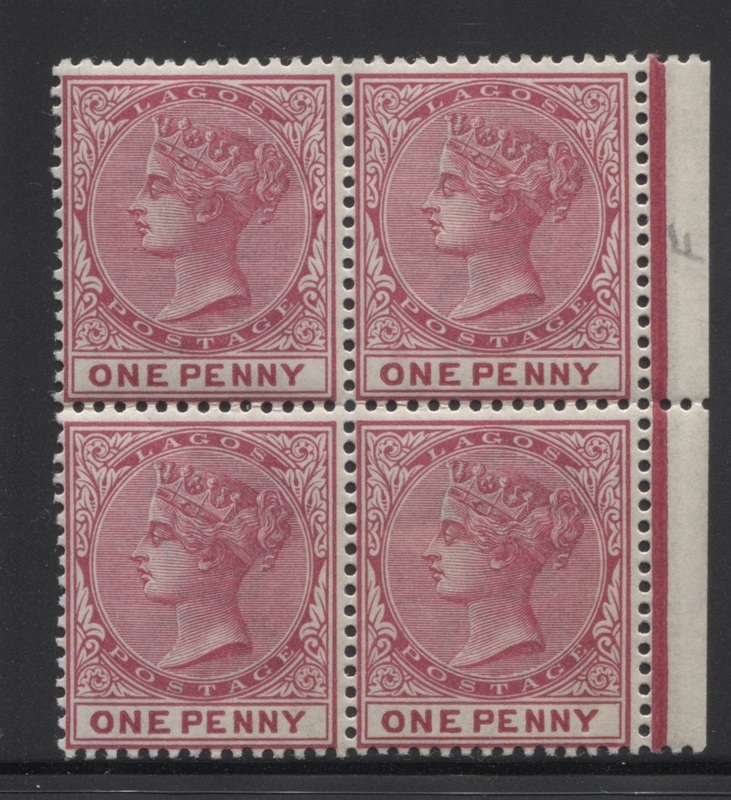 Due to the inexactitude associated with the measurement of different components, it was quite common to get variations in the resulting colour of the stamps. These variations in colour are referred to as "shades" by collectors. 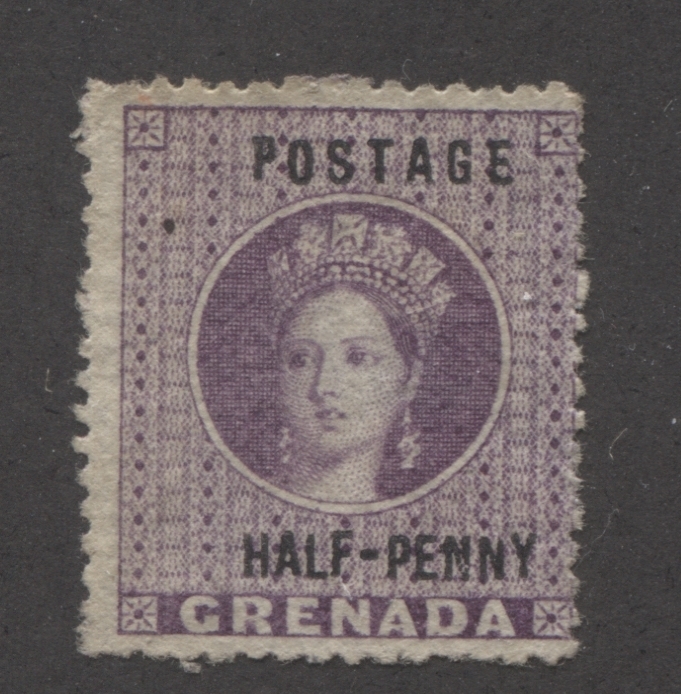 Shades can be either quite sublte, or they can be quite obvious, as in the case of the coronation stamp above. Despite being a relatively obvious shade difference, there are many such differences that nonetheless, are not listed in even very specialized stamp catalogues. A souvenir sheet is a small sheet consisting usually of fewer than 10 stamps, which has a very large decorative border. These sheets were first issued just before World War I, and have continued to increase in popularity over the years. Originally the sheets issued in the 1920's and 1930's were generally only available at philatelic exhibitions and you could only buy one sheet with one exhibition ticket. As a result the issue quantities of early souvenir sheets were quite low and these are worth a lot of money today. By the 1960's most souvenir sheets are only worth a small premium over the basic stamps contained in them. 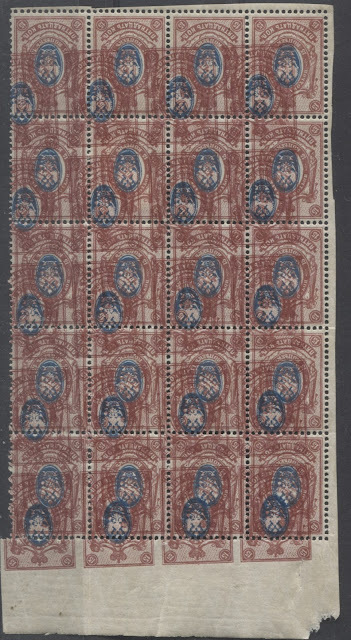 Once again, mint sheets are not uncommon, but used ones on cover, used when on sale are rare, and highly desirable. One service that used to be offered in most countries, that no longer is in many, is special delivery. Special delivery was simply a faster delivery of a mail item than the regular first-class mail stream. There was no tracking and no additional security for the item. The post office would generally charge a fee for this service and would attach a label to the envelope to indicate the payment of this fee, such as the cover shown above. Most countries have discontinued special delivery services and have replaced them with courier services or quasi-courier services, such as Expresspost (in Canada), which have built-in tracking and insurance, and which cost A LOT more money. In the early days of the postal system, prior to 1874, most mail to foreign destinations was carried by ships, each of which had their own carriage fees, and the fees were either paid upfront by the sender, or the recipient. It was the job of the postal administration in the sender's country to ensure that the postage was paid, or to properly indicate the amount to be paid if it was not. Thus there was little need for a foreign postal administration to concern itself with what the stamps of other countries looked like. However, in 1874, the Universal Postal Union (UPU) was formed in Berne, Switzerland. The UPU's job was to streamline the international mail system by standardizing postage rates, by standardizing some elements of the stamp's design and by making all postal administrations responsible for ensuring that the proper postage on letters was paid. Thus it became necessary for each member nation's postmasters to be aware of what the valid postage stamps for each country looked like. Otherwise, a postal clerk in the receiving country could not know if the postage on an incoming letter had been properly paid. To enable the various member countries in the UPU to know what each member's stamps looked like, a very small proportion of each issue of each country was set aside and overprinted with the words "specimen", or its language equivalent. The above scan shows three examples of a Lagos stamp from 1894 with a specimen overprint. The very earliest, specimens, which are very rare, had the word "specimen" applied in pen, rather than being overprinted as in the above example. The collecting of these overprints is a very specialized and challenging field, due to the rarity of most issues, since usually fewer than 400 of each stamp are made. However, because it is not mainstream, most specimen overprints are worth, much, much less than their rarity would suggest they should be worth. In fact, for many of the higher value rare stamps of the world, a "specimen" overprint is the only affordable way they can be collected. 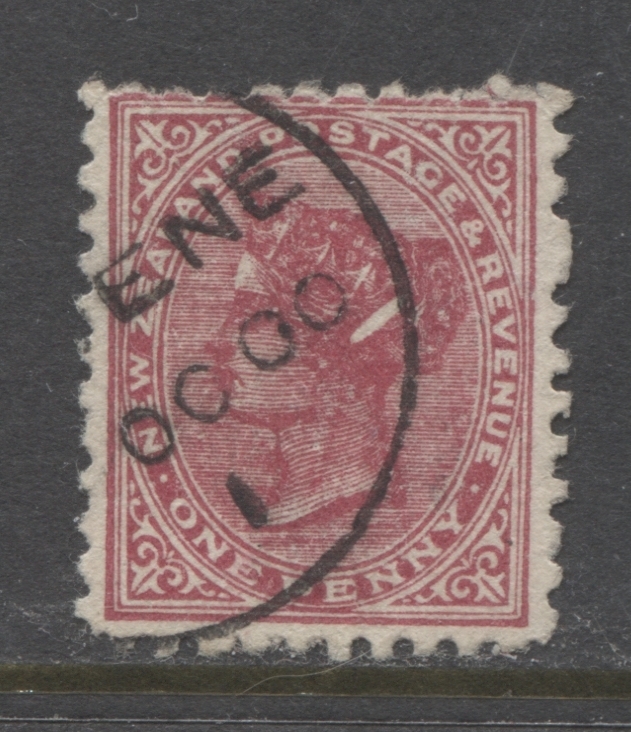 This type of cancellation became quite prevalent in the 1890's in many countries. A squared circle cancellation typically consists of a circular date stamp, to which a series of contour lines have been added at the arcs of the circle to convert the overall shape from a circle into a square. 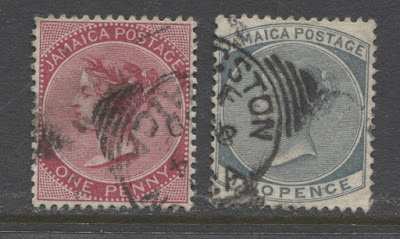 This type of cancellation is found on several of the British Commonwealth countries from the 1890's onward, including Canada and Jamaica, of which two issues are shown. A cancellation that is circular that consists of short lines radiating out from a centre is often referred to as either a sunburst cancel or a starburst cancel. 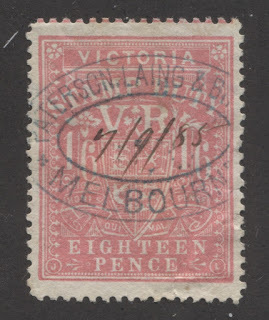 These types of cancellations are found on the stamps of several countries including New South Wales before it became Australia, Fiji and the Treaty Ports of Hong Kong in the 1860's. Many of the Hong Kong Treaty Ports are very scarce and worth quite a significant amount of money. In ordinary parlance, the word surcharge means an extra charge, over and above some baseline amount. In philately, a surcharge is any overprint that has the effect of changing the stamp's denomination - either to increase it or decrease it. 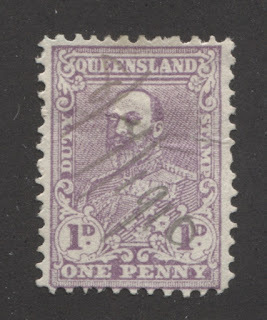 The stamp from South Australia shown above was originally a four pence stamp and was printed in violet. This stamp was re-printed in green and then surcharged down to 2.5 pence. Some surcharges change the currency s well as the amount. Many large countries like France, and Great Britain had offices in Asian and African countries, and several territories that they administered. Oftentimes rather than have that territory or country issue its own stamps, these countries simply took their own stamps and overprinted them with the country name and a surcharge to change the currency into the local currency. A surface cover is one that traveled exclusively by land and sea. Surface was the standard method of transmission until airmail became popular and affordable in the 1950's. However, airmail did not become the standard method of transmission until the 1970's, with surface still being offered as a less expensive option. Today, surface is generally not available in many countries for lettermail, though it is often still offered for parcels. Envelopes sent by surface were generally not marked, though sometimes "by sea" or "sea mail" will appear on the envelope. Most of the time though, the only way to identify a surface cover, particularly for modern covers, is to know the postage rates. Quite often, pre-printed airmail envelopes were used for surface mail, such as in the case of the above cover to the Canary Islands. This can mislead the unwary collector into thinking that the cover went by air when it did not. Tagging is a chemical overprint that has been applied to a stamp to enable a facer cancelling machine to "see" where the stamp is on an envelope so that the cancellation can be applied in the right place. Different countries have used different chemical compounds, and have either applied these in the form of bars on the stamp, have applied them all over the stamp, or have mixed them into the inks used to print the stamp. For some countries, such as the USA and Great Britain, the chemical compound used is phosphorescent and can only be seen under very dangerous short-wave ultraviolet light. For other countries, such as Canada and many European countries, the compounds are either phosphorescent or fluorescent and can be seen easily under the much safer long-wave ultraviolet light, which is the type of black lighting used in nightclubs. 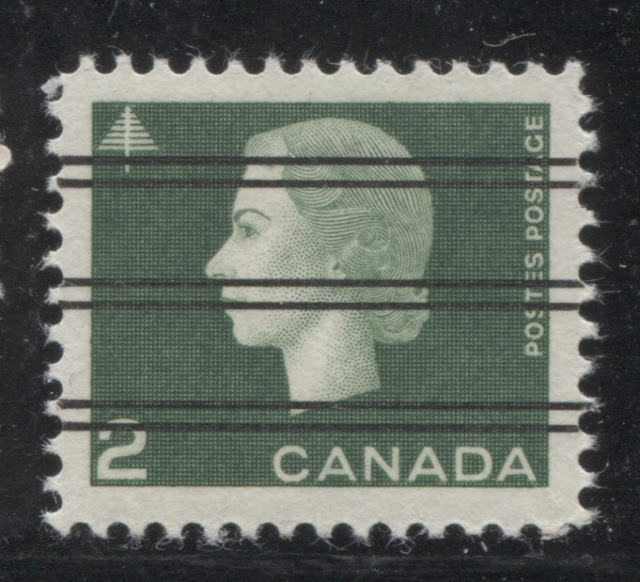 The above picture shows green Ottawa tagging bars of the kind normally found on just about all Canadian stamps issued after 1972. 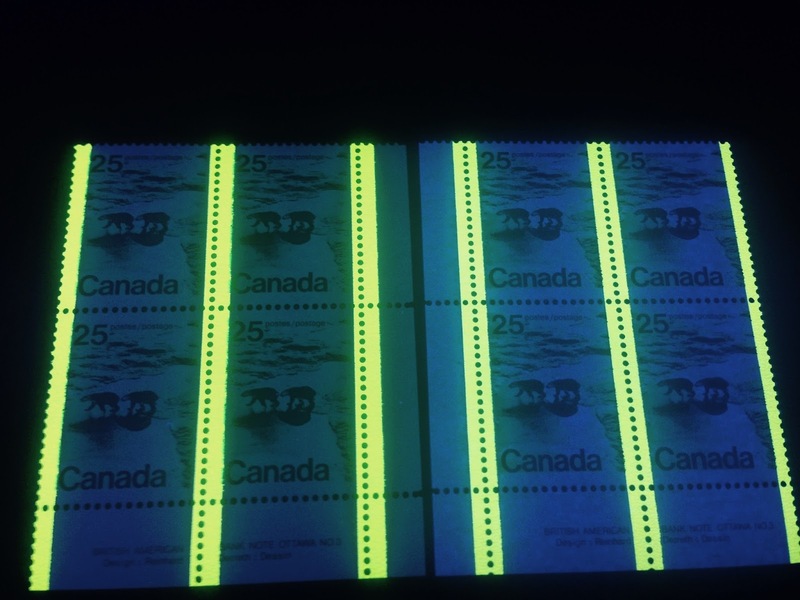 Prior to this, Canada used a phosphorescent compound that gave a much duller bluish white glow under ultraviolet light. Because it was first introduced in Winnipeg only, collectors have come to refer to it as Winnipeg tagging. Australia used a completely different, zinc sulphide based compound, called Helecon, which glows deep red orange under long-wave ultraviolet light. This compound was often incorporated into either the paper coating of stamps printed from the late 1960's onwards, or it was sometimes added to the ink. Tete-beche refers to a unit of two or more adjoining stamps in which the design of one stamp is inverted in relation to the other. 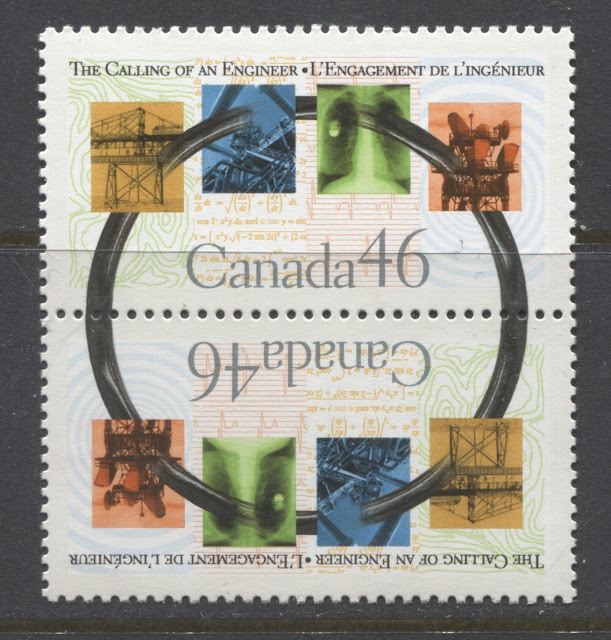 The above pair issued for the Calling of an Engineer in 2000, is, as far as I know, the only regularly issued tete-beche pair issued by Canada. 2. That the correct density of ink is being printed. These two things are partially achieved by having the printer place markings on the side margins of the sheet in the various colours that will allow the press operator to see instantly that the colour has been applied, and to the correct depth. These markings are usually in the form of coloured dots, like the ones shown in the block above. Collectors have come to refer to these as "traffic lights". One security measure that Austria used during the very early 1900's to prevent cleaning and re-use of stamps was varnish bars. These were thin diagonal bars of varnish that were applied on top of the designs after printing. The idea is that the application of the varnish would compromise the overall printing, so that any attempt to remove the cancellations would result in damage to the designs. The experiment was short lived with the use of these bars being all but abandoned by 1908. The above scan shows three examples of stamps that show varnish bars. 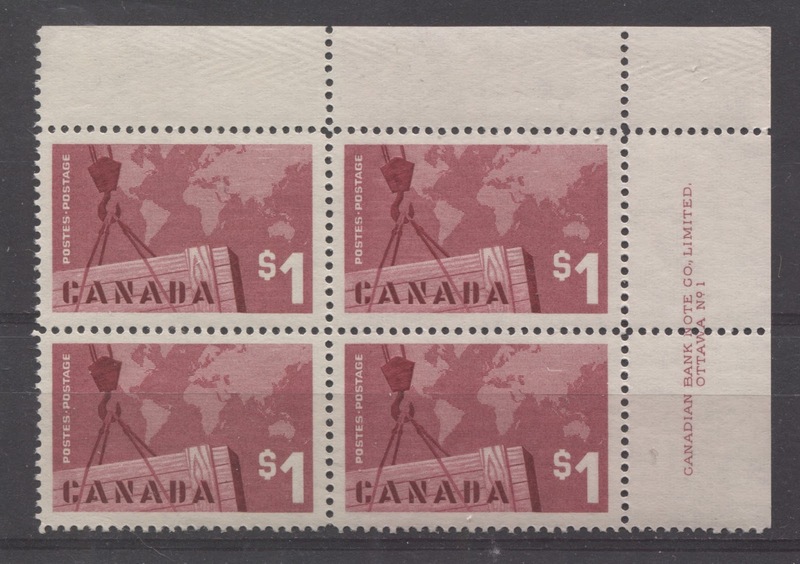 The bars are 3.5 mm wide on average and are overprinted across the stamps diagonally from top left to lower right. This is another term that may be specific to Canada, through many issues of the US have similar items to warning strips. 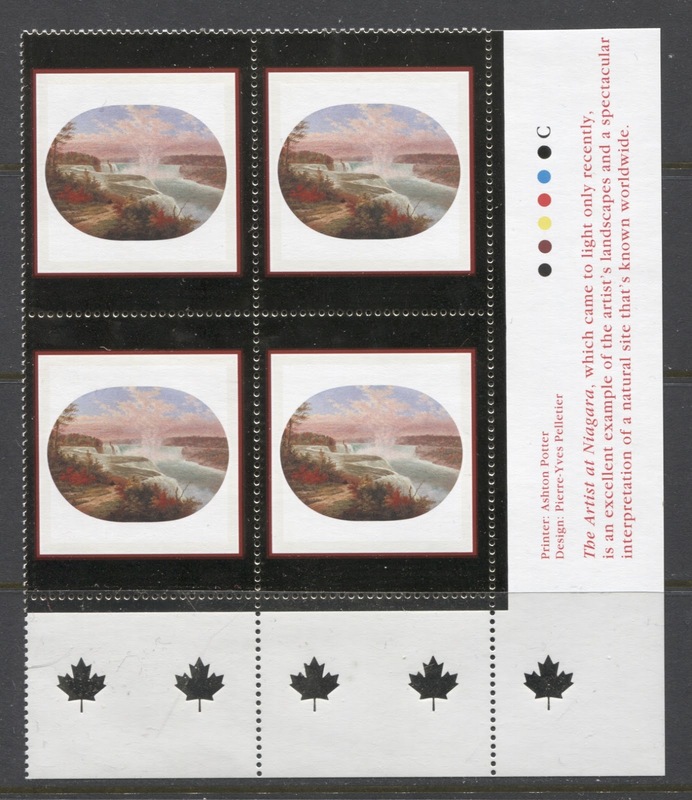 Precanceled stamps issued by Canada post were only made available to qualifying organizations at a discount from the face value. Consequently it was not legal for unauthorized individuals to use them. Each sheet of stamps sold accordingly contained a warning to this effect. Vertical strips of 20 from either the right or left side of the outer panes that contain the full warning, are called "warning strips", and are highly collectible. This concludes my rundown of the first 21 philatelic terms of many which I will write about over the next few weeks. After I have completed these posts, I will return to my posts about the issues I was writing about before. A watermark is a design that is impressed into paper when that paper is manufactured. The design actually results from the fact that the paper is thinner than the surrounding paper at the points where the design is. The watermark is produced using an dandy roll, which is run over the paper pulp under very high pressure. The parts in the dandy roll that comprise the actual design of the watermark are called the 'bits". The above scan shows a commonly used watermark within the British Commonwealth that was in use from 1880 until about 1903: the Crown CA watermark. A "wing margin" refers to a very specific type of wide left or right margin that is only found on some British Commonwealth stamps that were printed by De La Rue in the 1860's and early 1870's. Back at that time the printing sheets consisted of two panes of 60 stamps that were separated by a gutter. For a time in the 1860's and early 1870's, this gutter was only perforated with a single vertical column of perforations down the middle. The result was that the stamps on the left side of the gutter would have an extremely wide right margin, while those on the right side of the gutter would have a very wide left margin. These came to be known as wing margins. It was not fashionable to collect these stamps with these wide margins, and so a very large number of them have been cut down and re-perforated over the years. On the issues of Great Britain, it is possible to identify these positively by the corner letter combinations, but on other issues it is more difficult. 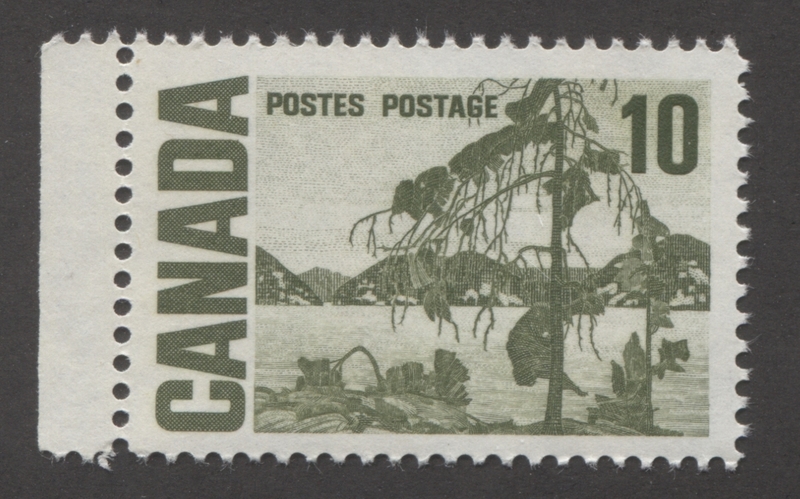 The above stamp is from British Columbia and was issued in 1867. Wove paper refers to the majority of stamp papers which do not show laid lines or batonne lines. It is manufactured in much the same manner as laid paper, except that the wire mesh over which the pulp is laid prior to being pressed, has evenly spaced gaps and hence the paper will not show lines as such. However, if the gaps in the wire mesh are large enough, the paper will exhibit what we call mesh, which is the term we use to refer to the distinct grain that is sometimes visible in the paper. On the half cent black Large Queen stamp shown above, you can see a clear horizontal grain. This is referred to as horizontal mesh. On other papers, particularly on modern issues, the paper is manufactured in such a way that there is no visible grain at all. Article contains so many fruitful information which will be liked by the readers as in my opinion this is the best article in this category. I like the content of this blog so much and I would like to thank to the blogger for this . Today, I finish off my examination of the 15c Bylot Island stamp from the series, with an exploration of the printings made using PVA gum. Unfortunately I do not have some of the scarcer paper varieties on hand, so my descriptions will be less than complete, and I will have to add examples as they become available. The bill stamps of Canada are the first revenues to be listed by Van Dam and also provide a fine field for the philatelist who is looking to collect beautiful stamps, while having the chance to form large studies of varieties. They were each printed by a different firm, with the Canadian Bank Note Company (CBN) printing the first issue shown in the middle, the American Bank Note Company (ABN) printing the second issue, shown on the right and finally the British American Bank Note Company (BABN) printing the third issue, shown at left. All stamps were printed in sheets of 100. The first issue was in use from 1864-1865, the second from 1865-1868 and the third from 1868 until the 1890's. Today's topic concerns the removal of old stamp hinges from mint and used stamps that you acquire, particularly the dangers associated with doing so and some techniques for determining whether or not it is possible to safely remove a hinge and then for ensuring their safe removal. 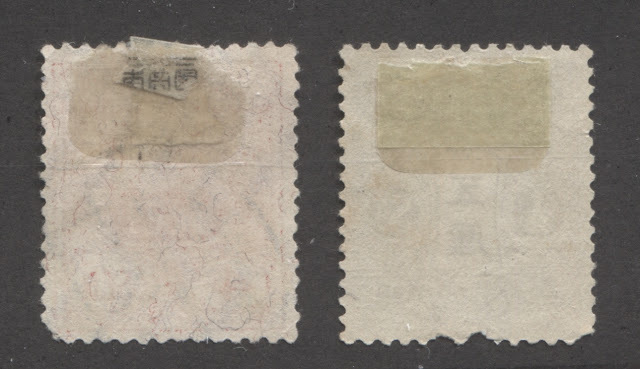 This post generally refers to mint stamps, as most used stamps can simply be soaked in water to remove the hinge remnant. However there are some notable exceptions. For example, many high value stamps of the British Commonwealth are printed in doubly fugitive inks and will fade with exposure to water. Other issues, such as the Queen Wilhelmina issues of the Dutch East Indies are printed in watercolour and will completely disappear when soaked. So in those cases, the comments here are completely relevant. I have been passionate about stamps and postal history since I was 6 years old. I am a Chartered Accountant in good standing with the Ontario Institute. I was until July 2015 a partner of a mid-sized Toronto firm. I left in July 2015 to pursue my passion of full time stamp dealing.